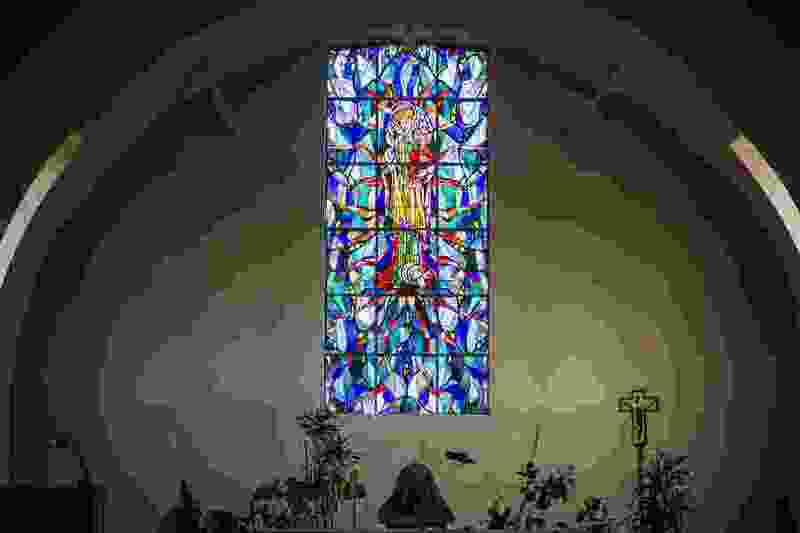 (Chris Detrick | The Salt Lake Tribune) A stained-glass window in the church at the Abbey of Our Lady of the Holy Trinity in Huntsville on Wednesday, Aug. 23, 2017. Plenty of prayers have been offered. Monks do that. But, ultimately, the future use of the Abbey of Our Lady of the Holy Trinity’s 1,800-plus acres will ride on money — lots of it. The few remaining Trappist monks who will shutter the 70-year-old Huntsville monastery at month’s end have pleaded that their longtime home be preserved as a combination heritage site and active farming operation. In January 2016, Bill White, a Huntsville Town Council member and attorney, bought the abbey for an undisclosed amount. He cited a lifelong admiration for the monks and fears the property could be parceled up for development. He undertook the purchase as a stopgap move to give time for preservationists to acquire the remote Ogden Valley site. That effort is multipronged. In addition to White, the nonprofit Utah Open Lands conservation group, the Legislature and Utah State University agricultural students are in the mix, too. Repeated attempts to contact White for an update were unsuccessful, but it is expected that $6 million will be needed to make the preservation dream come true. The Rev. Brendan Freeman, abbot of the monastery, understands that the businessman knew from the start he would likely lose money on the deal. “He just loves the monastery and the monks,” Freeman says. So does Rep. Gage Froerer, R-Huntsville, who hopes to free up state conservation funds to protect the site. The idea is to give USU funding for “some type of research facility at the monastery, a farm management operation,” Froerer says. “We’re not there yet,” the lawmaker acknowledges. “We’re still in some negotiations [with White] but I’m hopeful we’re getting close to a resolution. White reportedly is seeking “conservation easements,” which Freeman believes the businessman wants as an additional guarantee that future owners will resist the lure of selling and stick to preservation goals. Wendy Fisher, executive director of Utah Open Lands, says specifics of how to obtain the needed funds to buy the land for conservation remain in flux, but she remains “excited by the prospect of preserving the monastery property. Those interested in donating to Utah Open Lands’ effort to raise preservation funds can visit the organization’s website at https://utahopenlands.org/.